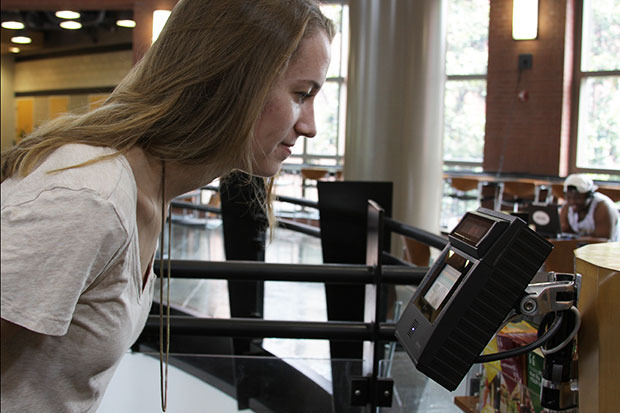 Auburn University has updated and expanded an iris biometric access system used at its athletic facilities. Biometric security systems provider Princeton Identity Inc., is providing its new IDS software and Access200 iris readers as part of the latest system update. According to a Princeton Identity white paper, biometric access at Auburn enables student-athletes, coaches and authorized guests enrolled in the system to unlock doors to facilities and team locker rooms. To access these areas, individuals simply look at small iris readers mounted outside each door. Auburn’s history with Princeton Identity dates back to 2011 when it initially deployed an iris-scanning solution from the company. That system has been periodically expanded in the years since, and this past summer Auburn decided on a major system software upgrade to Princeton Identity’s latest software platform, Identity Software (IDS). The university had previously installed and used biometric hand-readers in its athletics facilities, but the modality and its implementation carried some drawbacks. Steele also highlighted instances of student-athletes sometimes injuring fingers during practice. The subsequent swelling would throw the reader off, preventing it from properly identify the student. This happened so often that student-athletes and coaches started propping the doors open, defeating whole point of having a system in place, says Steele. well as the locker rooms of the teams’ coaches. Access rights are managed through a Lenel OnGuard access control platform, which integrates seamlessly with the Princeton Identity system. The iris readers are positioned at each secured door and communicate over the network with the Lenel OnGuard application server. The iris solution is fully scalable, capable of holding and differentiating between thousands of enrollees, including athletes, student trainers and managers, coaches, and contractors requiring access to the facilities. Auburn is now running Princeton Identity’s IDS that manages the new generation of enrollment and access readers. The latest update also swapped out enrollment readers for the newest Access200e devices. In the past, Auburn had to process all new enrollees from a central office. But with the new updates, system administrators can carry a laptop or tablet, and the new portable enrollment camera wherever the team is to conduct enrollment. It’s a feature that’s expected to be extremely convenient when Auburn’s football team of nearly 170 students will be enrolled next year. For more on the iris biometric access system at Auburn, check out the full Princeton Identity white paper.